FINAL RESTING PLACE—The casket of John Curry, an Irish immigrant, before burial in the cemetery of St. Patrick’s Old Cathedral in Lower Manhattan following a Requiem Mass May 13 at the parish church, the Basilica of St. Patrick’s Old Cathedral. WITH DIGNITY—The earthly remains of John Curry, an Irish immigrant, are laid to rest in the cemetery of St. Patrick’s Old Cathedral in Lower Manhattan following a Requiem Mass May 13 at the parish church, the Basilica of St. Patrick’s Old Cathedral. Cardinal Dolan served as principal celebrant and homilist. At far right are Bishop John Barres and Auxiliary Bishop Robert Brennan of Rockville Centre. Curry, who died in 1943 at age 69, had been buried in an unmarked, mass grave in a Long Island cemetery. 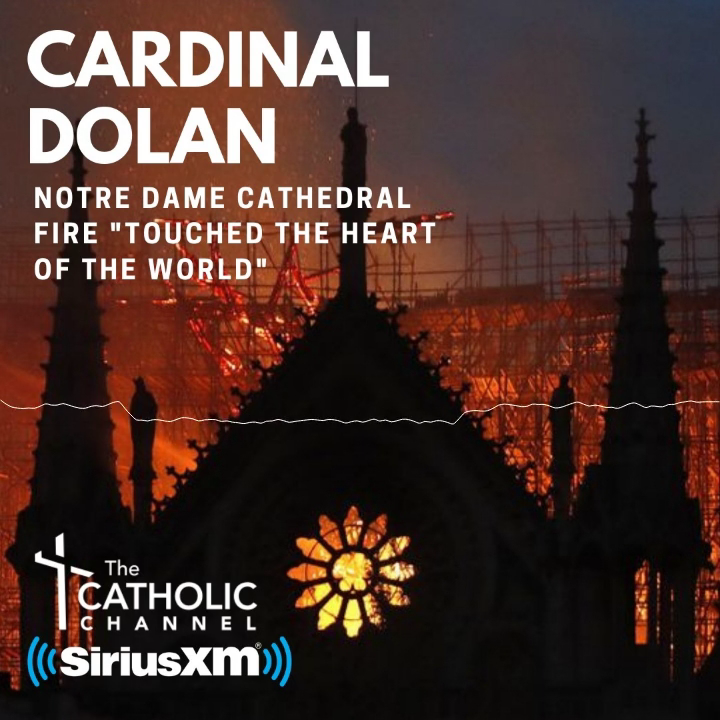 The arrangement for the reinterment was made after Cardinal Dolan, while leading a pilgrimage to Knock in August 2015, learned the story of Curry from the rector of the National Marian Shrine of Knock, Father Richard Gibbons. A dignified headstone that bears Curry’s name is in place. IN REMEMBRANCE—Cardinal Dolan serves as principal celebrant at the Requiem Mass for John Curry, an Irish immigrant, who died in 1943 at age 69. REQUIEM MASS—Cardinal Dolan, alongside Father Richard Gibbons, rector of the National Marian Shrine of Knock, leads the faithful in the Consecration to the Immaculate Heart of Mary at the Requiem Mass for John Curry, a Knock seer, at the Basilica of St. Patrick’s Old Cathedral in Lower Manhattan May 13. Rain fell heavily during a solemn Requiem Mass as a humble churchman of the 19th century was remembered nearly 140 years later for his simplicity and relative anonymity. The rain outside the Basilica of St. Patrick’s Old Cathedral in Lower Manhattan May 13 provided a fitting farewell for the 69-year-old Irish immigrant John Curry who, at age 5, was the youngest of the 15 official witnesses to the apparition of the Blessed Virgin Mary, St. Joseph and St. John the Evangelist in Knock, Ireland, just as rain fell there on Aug. 21, 1879. Curry, the last surviving official witness of the apparition—he had died in 1943 without wealth or acclaim, and had been buried in an unmarked, communal grave on Long Island—was reinterred in the stately St. Patrick’s Old Cathedral Cemetery that surrounds the basilica immediately following the late morning liturgy. “Now, at last, he’s in a dignified grave, worthy of a witness of the Apparition of Knock,” said a grand-nephew, 77-year-old Martin Curry of Ireland who, when his grand-uncle died, was in his fourth year. The arrangement for the reinterment came about after Cardinal Dolan, while leading a pilgrimage to Knock, learned the story of Curry from the rector of the National Marian Shrine of Knock, Father Richard Gibbons. Father Gibbons, a number of Curry’s relatives in Ireland, as well as other pilgrims from Ireland, attended the Mass and reburial. Cardinal Dolan had invited the faithful of the archdiocese to attend, and they did. The liturgy was also livestreamed on the internet. Among the numerous clergy were Bishop John Barres and Auxiliary Bishop Robert Brennan of Rockville Centre and Msgr. Donald Sakano, pastor of St. Patrick’s Old Cathedral. Also attending were archdiocesan officials; Little Sisters of the Poor; Barbara Jones, the consul general of Ireland in New York; leaders of the Irish American community, the Ancient Order of Hibernians, and the Knights of Columbus. Father Gibbons presented to Msgr. Sakano a portion of the original stone, from the original gable, of the apparition. Father Gibbons said he had also presented one to Cardinal Dolan. “We are blessed to have him here as part of the story of St. Patrick’s Old Cathedral,” Msgr. Sakano, in his remarks, said of Curry. He did not marry and in 1932, due to ill health, entered a home for the elderly, operated by the Little Sisters of the Poor, on East 70th Street in Manhattan. He died there in 1943. Neither sister was aware of the circumstances of how Curry came to be buried in the mass grave on Long Island. The Little Sisters brought to the Requiem Mass a copy of the home’s registry that bore Curry’s name, and a picture of him there.